If you are struggling to manage your time well or simply need a tool to help you break down complex tasks, the 30/30 iPhone, iPod Touch, and iPad app comes to your rescue. 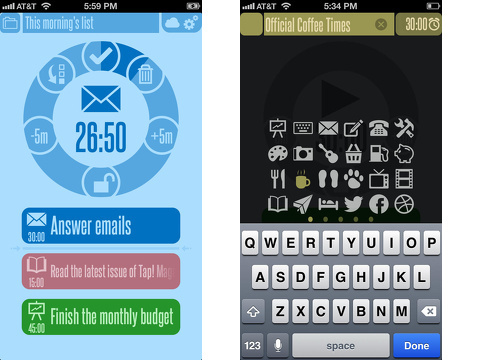 This productivity iOS app offers customization options, intuitive gesture controls, and sophisticated graphics that make time-management fun. A free download from the iTunes App Store is loaded with thoughtful touches and an inspiring interface. One of the most helpful features of the 30/30 iPhone app is the ability to create multiple action plans. You can title and save a plan for repeated tasks. Instead of being tempted to answer every ping on demand when working, you can schedule intervals of time designed for specific tasks. If you are planning to clean out and organize closets, then you could set up timers to sort, put away, and take things to the trash. The options allow you to use the time you have efficiently, so you can accomplish more. At first, the gesture controls seem overwhelming, but they make the 30/30 iPhone app much more interesting and useful. You set up your first task list on a cool introduction screen. You title your list by using a double tap in the title area in the top of the screen. The double tap gesture is used throughout the interface to edit information. Below the list is a simple timer with 30 minutes. A touch on the start icon begins the countdown. You can add or remove five minutes with a tap on the timer’s icons too. You label each brightly colored field with a new task. You type a name, then you touch a graphic to categorize it. You can allot time to sleep, Facebook, Twitter, get gas, and many more. In this same label interface, you can change the amount of time for each task, but the default is always 30 minutes. You can tap and drag a task to change the order. You tap three times to copy a task. Once you start creating your own lists, you use the gesture where you spread your fingers vertically on the screen. To create a new list, you touch the folder icon in the upper left corner. Then, you slide your fingers apart, and double tap on the new field to start your new list. When you add tasks to your lists, you spread your fingers apart vertically below the timer. When you decide to insert a task, you separate two tasks vertically and a new field appears. You can also activate the shake feature in settings to undo actions. If you need to refresh your memory about gestures, you touch the settings icon to access the tutorial. The bright colors, smart tools, and practical premise of the 30/30 iPhone, iPod Touch, and iPad app make it an excellent tool for work, school, and home. AppSafari review of 30/30 was written by Jenni Ward on February 3rd, 2014 and categorized under App Store, Enterprise, Free, iPad apps, Productivity, Universal, Utilities. Page viewed 3748 times, 1 so far today. Need help on using these apps? Please read the Help Page.